Donna cheek was very helpful in helping my wife and i purchase our home.. she went above and beyond out of her way to help… i would highly recommend donna for anyone trying to purchase a home. Donna had success selling in our area. She is very professional and worked well with the buyers agent. We will definitely have her help us in the future and will recommend her to everyone. Donna Cheek was always accessible for questions and concerns. She was very responsive with concerns and sought out answers to our questions. She is totally focused on her clients and theirs needs. Donna went above and beyond anything I expected from an agent. I could not have been more pleased with her performance in handling the deal. I found Donna online when we were thinking of selling our lake property. She had a website dedicated to Wood Creek Lake properties and obviously knew that she was doing. She had been working with a client who was looking for a lake property and was able to match them up quickly with our listing. The sale took place quickly and was handled very professionally. I would highly recommend Donna! We are new to the area so we needed to find a person who we could trust and who had great local knowledge. Donna Cheeks was the perfect person. She worked very hard to find us the right home and was someone we trusted during the negotiation process. 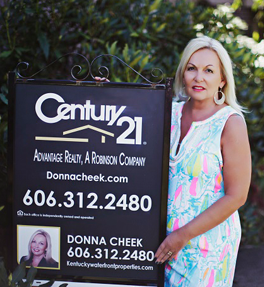 I highly recommend using Donna Cheek if you are interesting in purchasing a home or property in the London, KY area. She is a pleasure to work with. Donna Cheek is the epitome of professionalism. She works for her clients. Had an open line of communication. She truly cares and is willing to work hard. If we were to sell again or buy we will be calling Donna.